I have never tried scuba diving before, so making slow steps towards it, in the first days, I got acquainted with snorkeling. Soon as I got my mask on in the water, I could see a different world at the bottom of the ocean with blooming coral reefs and many types of colorful fish swimming around me. Since I could only recognize those ones from the movie "Finding Nemo", I realized I need to broaden my knowledge in marine life. My ultimate favorite places for snorkeling were Tulamben with its dazzling scenery of the shipwreck; and swimming with the magnificent manta rays at Manta point, next to the beautiful island of Nusa Penida. I will never forget the moment, when I spot the first manta passing by me - it was literally breathtaking -, and suddenly I could see many others "dancing" around. I´ve only wished I could swim with them like divers do - and that is how my diving experience began. It took me 4 days to complete the Open Water Diver course at OK Divers in Padangbai. First, we began with the theory - this is a necessary, but not so interesting part. Then it was followed by the practice in the pool. I was lucky for having a friend, Lila, with me during the course, who was just on the same level of inexperience as me - we shared the first struggles of putting on the wetsuit, weights, and all the inevitable equipment in order to breathe underwater. Our amazing diving instructor made every effort to teach us the required skills of an OWD diver. How to remove our masks in the water, balance our buoyancy or make safety stops. Patience was the key word in the pool, but finally, we succeeded. We were ready to take over the sea! 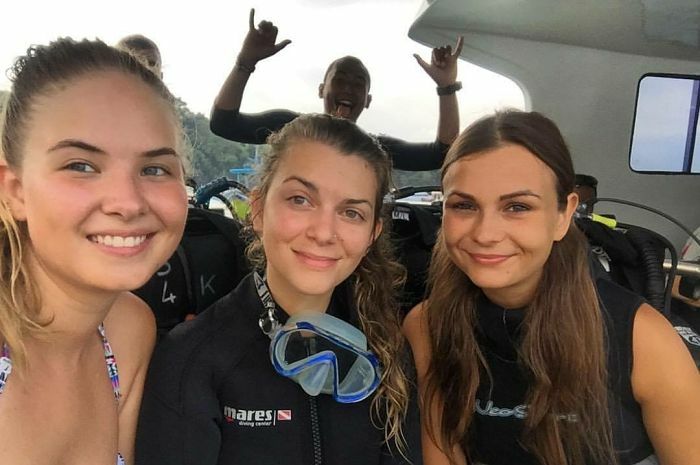 During the course, we did 4 dives, with the best company I could wish for - our instructor, dive buddies and dive masters made this special adventure even better. I found fascinating how divers can understand each other without saying a word, by learning a special sign language. Although we did a lot of practice while diving, the beauty of the lagoons made me forget all the work. The feeling of breathing and floating underwater, without making a single movement, is indescribable. A little pain in my facial muscles made me realize I was constantly smiling during the dive, that is how happy I was. I have tried and seen so many new things during these days, I cannot even recollect every memory - we swam around a boat wreck, searched for nudi branches, triggerfish, and stingrays, tried some yoga underwater and even hijacked a submarine (not a yellow one though).